We’ve already mentioned Russert, but I wonder if this will push NBC further left than it already has been. Excellent article in the Wall Street Journal yesterday from Dan Henninger . He reminds us that Brazil found out it has vast oil resources off their coast. When Brazil made this find last November, did its legislature announce that, for fear of oil spills hitting Rio’s beaches or altering the climate, it would forgo exploiting these fields? Of course it didn’t. Guilherme Estrella, director of exploration and production for the Brazilian oil company Petrobras, said, “It’s an extraordinary position for Brazil to be in.” Indeed it is. At this point in time, is there another country on the face of the earth that would possess the oil and gas reserves held by the United States and refuse to exploit them? Only technical incompetence, as in Mexico, would hold anyone back. But not us. We won’t drill. In our case what we have is a failure of leadership. The Republicans in Congress have started to catch on, but John McCain remains oblivious. A leader would have provided for our energy future, allowing us to also deal more effectively with thugs whose only resource is oil. The Democrats have not, and McCain is making noises like he will not, either. Congressional Republicans have started to tsep into that void of leadership, but I wonder if it’s enough. As an example of Congressional Republicans steppig up… I commented a while ago… and it still shows up in the “Snark of the Moment” once in a while… “Who is to blame? Here you are… When Democrats took over the Congress, gas was slightly more than $2 per gallon, food costs were low and supplies were plentiful, the housing market was booming. 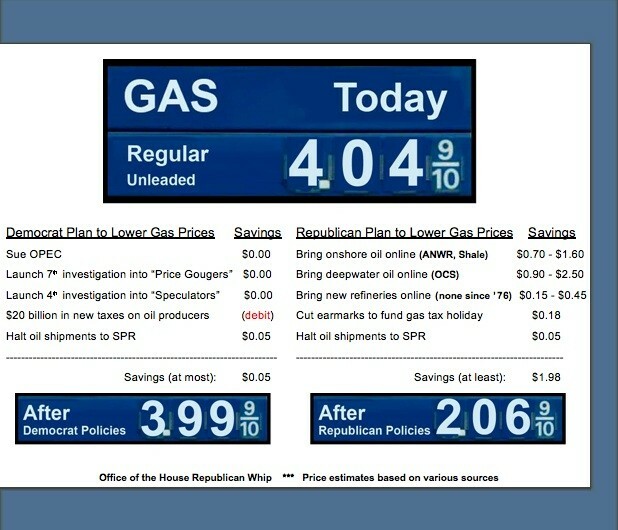 Since then, our food and fuel are both double the price and in shortages, taxes are up, housing is tight, as is credit.” Well, Republican Whip Roy Blunt passes along, by way of the Powerline Guys , a chart to drive that point home. (Drill the pic for a larger, clearer version) Go ahead, gang, tell me how the Democrats have our interests in mind. McCain should use the $4-a-gallon gas prices to pivot in favor of more drilling. Then, his people might have something more meaty to offer during these kind of calls. That’s exactly correct, Rich. And as I said yesterday I think we as Republcians…. and as Americans… should be putting the heaviest pressure possible on McCain to move in that direction, since it’s clear that the Democrats have a snowball’s chance of doing so. I think the idea of the Congressional Republicans taking the lead on this for now a fair enough idea, given the lack of anything better. Like for example a leader in the top role. We might be able to shame McCain into actual leadership on this issue, but I don’t know…. And in any event, I’m annoyed that we should need to.